My office is tidy Friday, mysteriously messy on Monday. Here’s what I found today! 1. Box of Discipleship books. Thanks to Al Giles who helped us get a nice discount on copies of Building a Discipling Culture. We’re going to have a discipleship roundtable discussion with Al on January 17th. If you’re in the Lancaster area, and you are interested in answering the question “What does it look like to be a disciple-making church?” perhaps you’ll want to join us. Let me know! 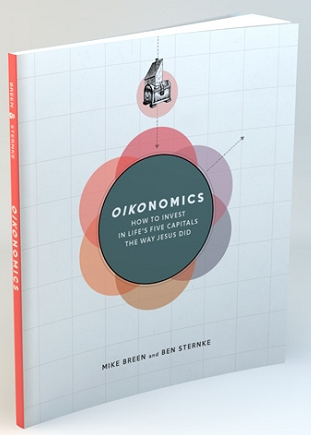 Because the printing company had a bad run with this batch, the publisher, 3DM, threw in three copies of another book that I am looking forward to reading, Oikonomics. The title sounds like a pig trying to say “economics”. 2. Background check documents. Last year we had our children and youth ministry volunteers do background checks, something we do every five years. Just this past month I found out through a colleague on the Conestoga Valley Ministerium that new PA law voids all those checks, and we’re going to have to do it again. Except that this time, the checks are more extensive…and expensive. Further, they’ll need to be completed every three years. My initial reaction to this was disappointment and frustration. But as I’ve given it some thought, I’ve come to see the new laws as good. It’s hard to know where to draw the line when it comes to protecting our kids. I suppose the state could have required us to do five backgrounds every year. So this week I plan on getting fingerprinted! 3. Planbooks. Those of you in the Evangelical Congregational Church know what I am talking about. Planbooks are the annual calendars that our denomination publishes. They’re filled with event dates, the seasons of the Christian year, and contact info for denominational leaders. Planbooks remind me, like the ministerium, that Faith Church is connected to the wider church. I value that connection greatly! Take the EC Church, for example. We are 150 churches in the USA, with another 400+ around the globe. On Thursday, a pastor from the EC Church of Liberia will be with us to talk about the amazing work our Liberian EC brothers and sisters are doing to reach out to fellow Liberians struggling with Ebola. If you’re nearby, feel free to join us at Faith Church at 1pm.